Incoming mail should be matched to the correct patient and filed in the clinical notes. 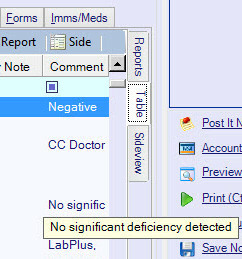 All matched lab results will then appear in the Results tab, at the bottom of the clinical notes screen. Any items that have not been “filed” will have a yellow background, to show that the results have not been read. If you added a comment when you viewed the mail item, this will be displayed in the right-hand column. Hover the mouse over any particular column to view the full entry. 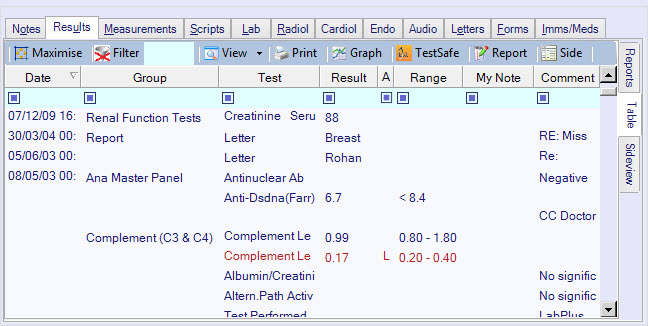 If the test result contains too much information to fit in the columns, hover over the “comment” column entry to see the full result. Table is the default option (shown above). Reports will allow you to scroll down through each result, in full. 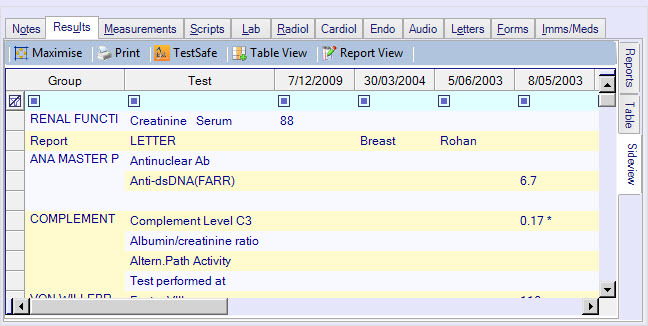 Sideview allows you to compare test results over time (shown below). Scroll down to view the different groups of tests; scroll horizontally to view the results across each consultation. Double-click on any test to view the complete mail item. This will move you to the Reports tab. Right click on a result for a list of other options. Select Graph to generate a graph. It will plot the results from previous tests of the same type. Select Filter to view only certain results. 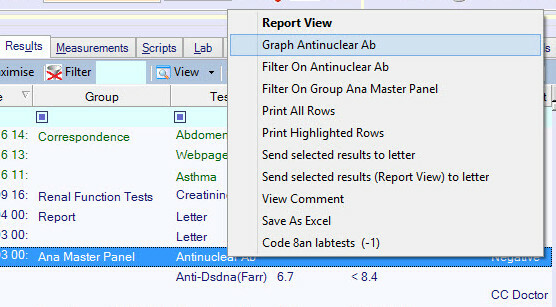 Select send selected results to letter to forward these results to another organisation or practitioner. If you view the letters tab, the results you selected will have been copied into the body of the letter.